RT interviews Susan Lindauer (see video here). The US is moving to place sanctions on anyone who opposes what Washington calls a democratic process in Yemen. 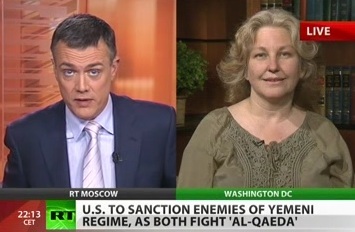 Anti-war activist Susan Lindauer says this brings the US right into Al-Qaeda’s trap. ­Yemen is fighting an alleged Al-Qaeda insurgency with military support from the United States. On top of this, the Arab state continues to suffer from months of political unrest, with anti-government protesters demanding more reforms.